Built close to an existing five megalitre basin, the latest storage was completed in eight months and is approximately 120 metres long, 45 metres wide and four metres deep. Some 60,000 tonnes of clay were used in the construction of its walls and floor. 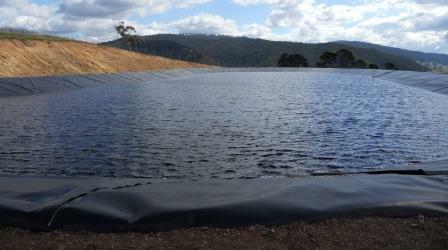 It is located above the Omeo Water Treatment Plant, which serves nearly 30 residential and non-residential properties. Water is drawn from Butchers Creek and gravity fed a distance of 12 km to the two storages. During periods of high flow, water will fill the basins to ensure there is enough supply available to cover any subsequent lengthy periods when flows in Butchers Creek are insufficient for extraction. This initiative was delivered as part of East Gippsland Water’s five year, $67 million capital works program, which concluded in June 2013. This program was designed to safeguard the long-term security of water supplies for all customers, regardless of the size of their community.